this past shabbat parshas metzora a case of safek tzura was discovered. the ot in question is the letter bet. the word is supposed to read "bohen" but it looks like a kaf kfufah. the tiny oketz seen near the back-middle of the ot (and normally present in a bet) does not kovea the tzurat beit. 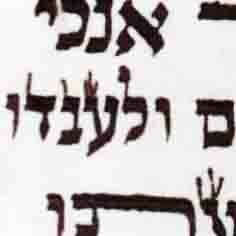 what IS m'akev, however, is a sharp corner on the bottom right of the letter's moshav. since this type of corner appears to be lacking from the moshav, l'aniyut da'ati the tzura is changed from a bet to a kaf. 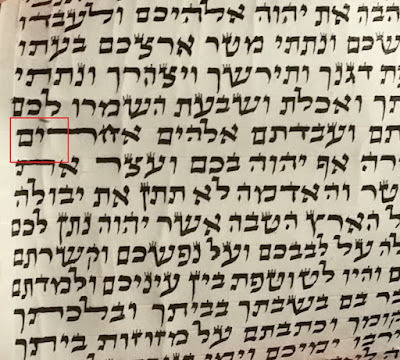 any opinions on the (in)accuracy of this svara, or any additional comments from the olam? looks like a kosher chaf to me. Before looking at the surrounding words, I instinctively read it as Kohen. I'm not really sure why you would need to ask a shaila on this in a sefer torah unless all the Beits in the sefer are made that way. 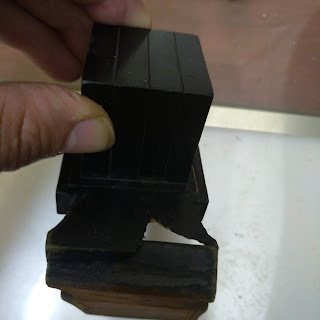 If you have any safek, just add a bit of ink to remove the safek. The problem is that since the letter is extremely round at the bottom and the akev is very faint, it could just as easily be a kaf with a mistaken bit added in as it could be a bet with a faint akev. In my opinion I would compare it to the other beitim in this ktav because that would go a long way to determine if its kosher or not. With the picture alone it could be argued either way. It is not obvious that it's not a kaf. Correct. If there is doubt.